Browse our resource center for insight into how Bright Computing is changing the way people manage clusters and clouds. "Using Bright reduces the labor and effort needed for management and change control, and also facilitates the accelerating trend toward cloud computing." 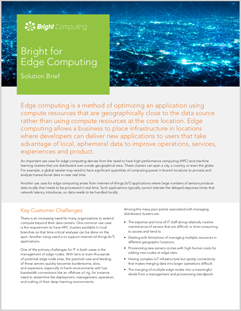 Learn how Bright takes the pain out of managing edge computing. If you need to manage a distributed cluster with nodes that may span a city, a country, or the globe, Bright Cluster Manager's Bright Edge feature can make your operation more efficient. 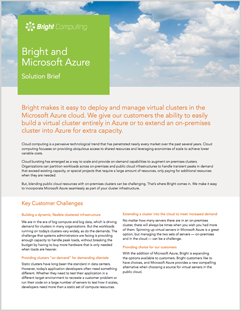 Bright makes it easy to deploy and manage virtual clusters in the Microsoft Azure cloud. We give our customers the ability to easily build a virtual cluster entirely in Azure or to extend an on-premises cluster into Azure for extra capacity. Bright makes it faster and easier for organizations to gain actionable insights from rich, complex data. 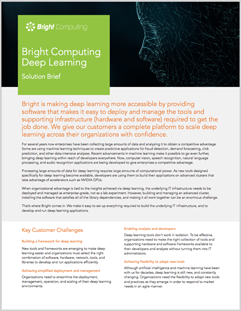 To achieve this, Bright offers a comprehensive deep learning solution that includes a modern deep learning environment, a selection of machine learning frameworks, selected machine learning libraries, and all of the necessary supporting Infrastructure Elements.